Fragranced lavender bathing salts, honey and coconut hand and body moisturizers, a rustic citrus basil candle and more make this hand selected gift the quintessential collection of an ultimate spa experience. 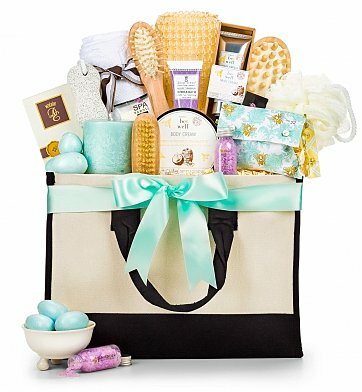 Hand-tied with a satin robin's egg blue ribbon, it's the perfect gift to offer someone who deserves a little pampering. Lollia Wish Bathing Salts Sachet, Organic Hand and Body Creams. Fragranced Robin's Egg Soaps, Lavender Bath Salt and Bubble Bath. Plush Bamboo Bath Towel, Rustic Citrus Basil Pillar Candle and more. Your gift will leave a lasting impression as they repurpose this stylish black and white canvas tote, perfect for travel or organizing in the home. Measures 14" x 10" x 5". Tranquility Spa Collection is a hand delivered gift. These gifts are delivered by one of our local design centers located throughout the United States and Canada. Same day delivery is available for most gifts when ordered before the cutoff time. The cutoff time for Tranquility Spa Collection is in the recipient's time zone. Be Well Honey & Coconut Body CreamPamper the skin with this buzz-worthy, nourishing honey-infused body cream containing all natural ingredients and fragrances. 8 oz. Lavender Bath CrystalsLuxury bath crystals infused with lavender, for a soothing and invigorating bath experience. 1.65 fl oz. Spa Scents Facial Bar (Aloe)Nourish and rejuvenate your skin with this aloe-rich facial bar. .705 oz. Wish Fine Bathing Salts SachetSugared pastille floral-infused bathing salts wrapped in a beautiful cloth sachet from Lollia by Margot Elena. 8.8 oz. Robin's Egg SoapsThese robin's egg soaps are delicately fragranced and gentle on skin. Spa Scents Vanity KitThis individually sealed kit includes 2 emery boards, cotton balls and cotton tips. Fine fragranced bathing salts, delicately fragranced soaps and more. Spa and bath accessories, essential oil body products, pillar candle. Collected in a signature GiftTree canvas tote. When you buy online you never know for sure what you are going to get. I was pleasantly surprised at the quality and contents of the basket. I sent 2 baskets from Gift Tree & both were liked very much. Gift Tree has the best selection & delivers when they say they will. Sent your Tranquility Spa Collection to my Mother for Mother's Day. I failed to include her apt. number, your customer service emailed me within hours requesting that data. They still got the package out that day even with my oversight and my Mom received it on time and was thrilled. She loved the quality of the tote, the volume and quality of the spa collection items and was just thrilled. This was the first time I used gift tree but you just earned a loyal customer. Thanks again! I just received this kit as a gift and I absolutely LOVE it! Wonderful detailed presentations and definitely a "wow" gift! I'm not even a bath products kinda girl but each item that's included in the kit has a "designer bath" quality feel. Thumbs up on this one! I recently purchased the Tranquility Spa Collection for my sister-in-law while she was recovering from breast cancer surgery. After she received it she telephoned me to say how thrilled she was when she received the gift. She said it made her so happy! I thought,she deserved some pampering after her surgery and was glad I decided to send her the Spa Collection.